More often than not, my weeknight dinner game is more about getting something easy on the table than something chef-y. Running around after a toddler who needs your attention 24/7 doesn’t exactly lend itself to slow braising beautiful fall off the bone short ribs with a red wine reduction sauce…in fact, we’ve been big on the sandwich dinners lately because they’re quick, tasty, and I could come up with 500 sandwich ideas off the top of my head. 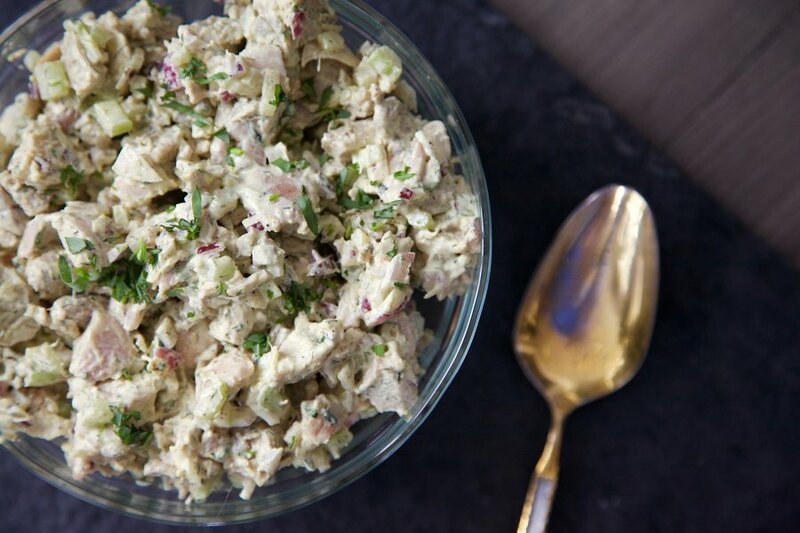 Last night, I decided to make a chicken salad because I had some fresh tarragon in the house, and for some reason, whenever I see tarragon I immediately think: Chicken Salad (a Chef’s mind is always a curious thing). 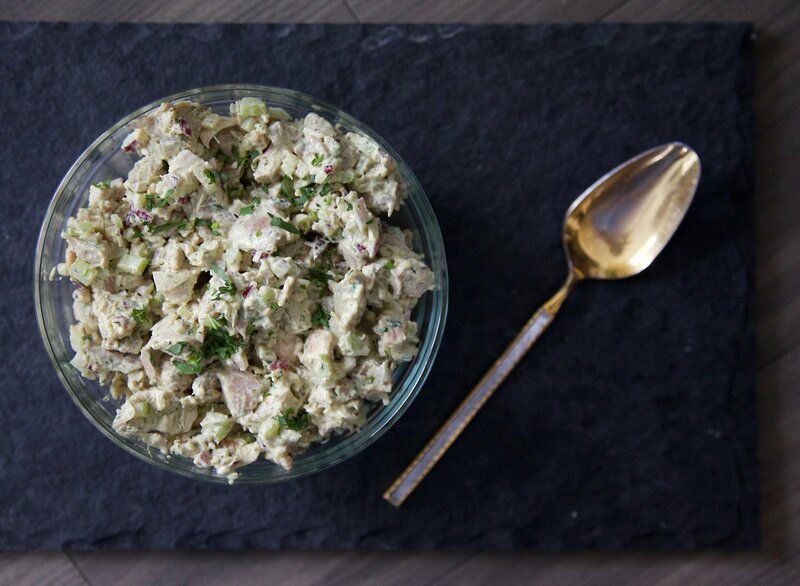 This is a super super simple recipe, and so incredibly flavorful! The combo of fresh tarragon, black pepper and rice wine vinegar really elevates what could be a pretty bland and boring meal. You can obviously eat this as a sandwich on your choice of bread or you can top a salad with it, or eat it on it’s own (I also applaud any meal that has this kind of versatility because sometimes you don’t have bread in the house). 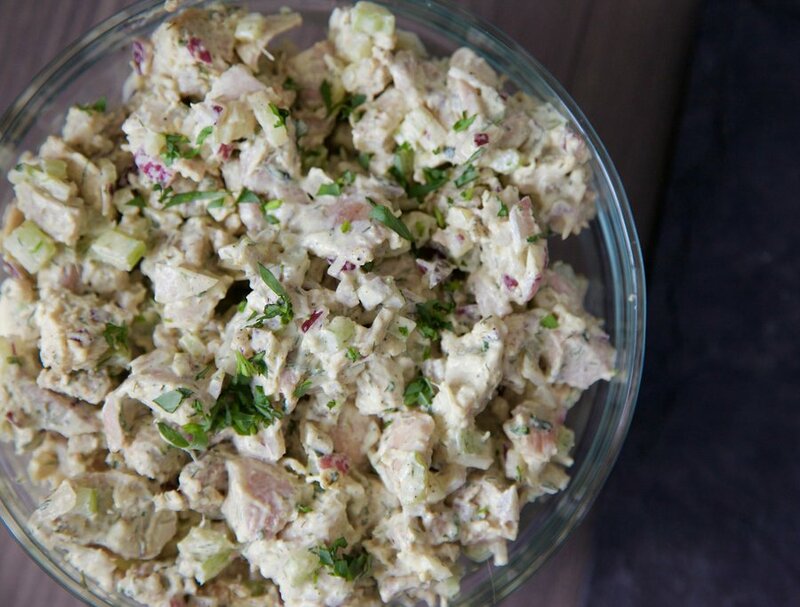 On a side note: I always make chicken salad with thigh meat because it’s way more tender, juicy and flavorful. 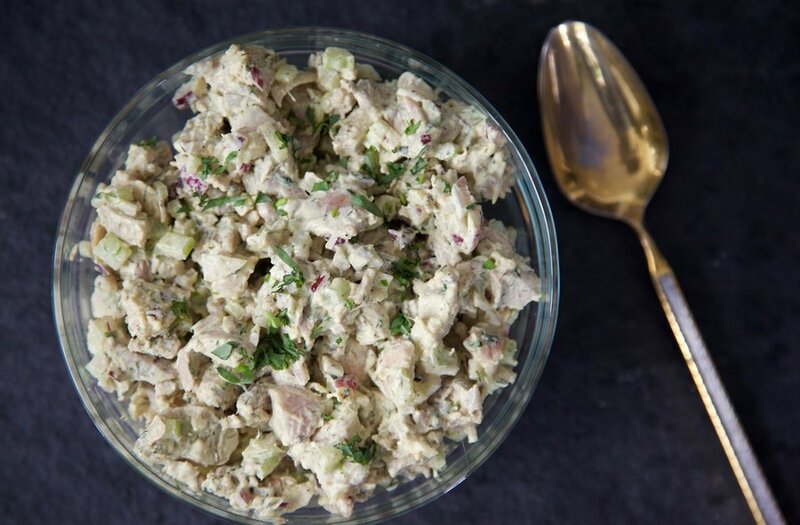 I find chicken salads made with white meat are always kinda dry and hard to chew, and if you plan on keeping your chicken salad in the fridge for a few days to nosh on, thigh meat will retain it’s juiciness and be less likely to dry out. 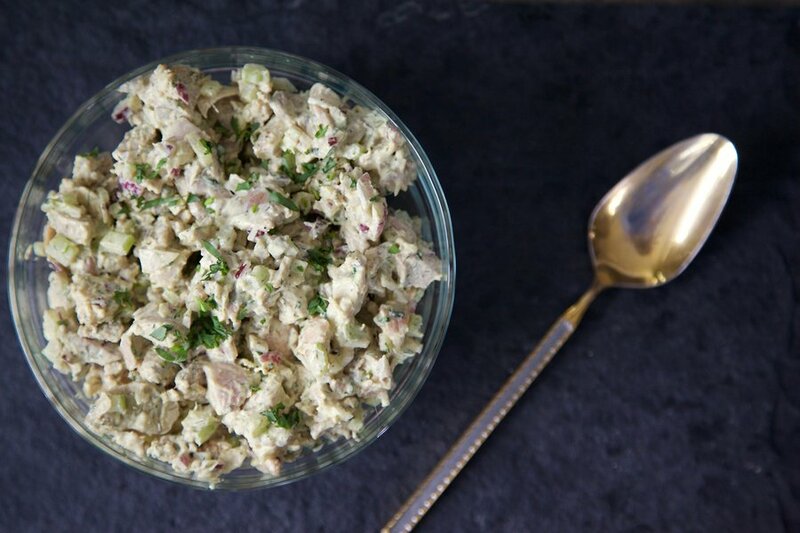 Some ideas with this chicken salad – top it with fun things like crispy bacon, avocado, various greens (Romaine would be perfect), tomato, etc etc. For the chicken thighs: season with salt and pepper - cook in a 400 degree oven for 22-25 minutes (until cooked through). Remove from oven, allow to cool, and then chop into bite sized pieces. While the chicken is cooking, combine all of your other ingredients in a large bowl and mix together. 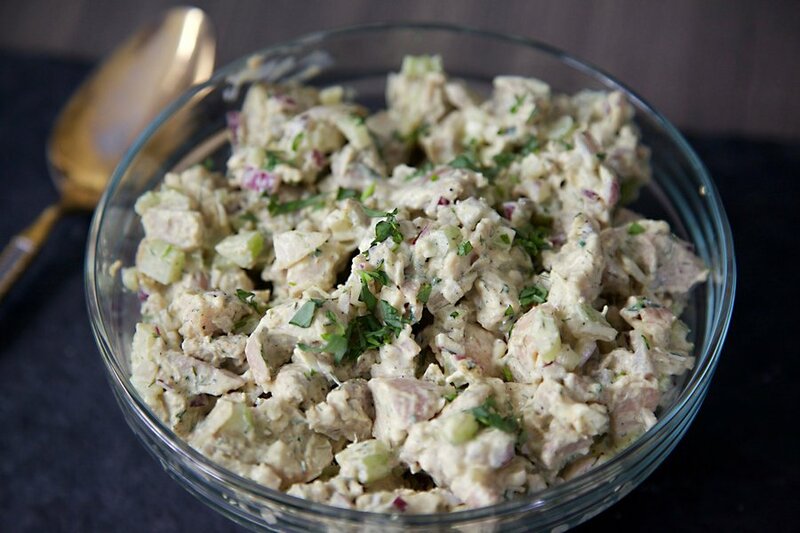 Once the chicken has cooled and is chopped up, toss it into the bowl, and mix to combine. Season with salt.